After 9/11, a Dutch bulb company has been donating 500,000 bulbs a year to NYC. 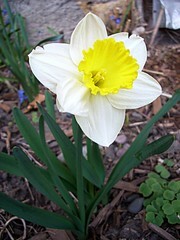 As of April 2007, the daffodil has been named the official flower of NYC. For this reason I hated them. It was similar to why people hate some lilies. It reminds them of death. I didn’t want to be reminded of that, I didn’t want to be reminded of what happened. Couldn’t stand them. And then I moved from NYC to Iowa. I was homesick. It is so DIFFERENT here. I like it, but it’s not NYC. Never will be. Couldn’t figure out how to shake it. Then last fall I was in the store, looking for bulbs. I got a little of everything, except the daffodils. And then I thought to myself, “why not?” I bought a few, and here you go. Daffodils. Well, a daffodil. I have more, but not in this picture. So the memorial for the victims of 9/11 is now my little piece of home in my front garden. I think I can grow to like the things. I no longer live in Brooklyn, but this is a great cause. Discounted spay/neuter certificates. You buy the certificate from the site or various places in NY, then go to one of their 82 vets that accept the certificate and get your pet spayed/neutered! It’s a surgery that people put off because of expense, so anything that makes it accessible is ok by me! there are enough dogs and cats in the shelter to go around and then some. We shouldn’t be adding to that.